The $16 Million Pegasus World Cup! World's Richest Horse Race! You must be a member of the Miami World of Horses Group to attend this activity. Would you like to join this group? Twelve famous horses, will compete for the $16 million dollar purse. The Pegasus World Cup race will be the last of 12 races. The first one is at 11:30am, and the main one around 5:30pm, and will be televised live on NBC Sports. A good place to meet is between the statue of Cigar and The Yard House before going in, or on the West side, end of the Paddock while already inside, which is where the horses are exhibited before every race. A bit of money to bet on each race will do wonders to make this much more exciting, because you'll have a stake in the race. Not much is needed, as bets are as low as $2 dollars. I usually make a couple of wagers in each, and often end up winning. There are a lot of ways to do it. You can bet to the winning horse, to the second, or to third place; combinations where you bet to 3 of the 4 winners regardless of the order, or in the order they finish and many many more. 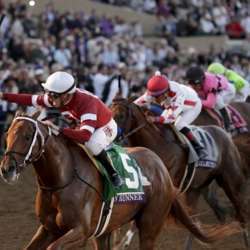 What these bets pay depends on the odds or probabilities of winning the horse or the combination has, obtained from the number of wagers made, which are widely announced until the last moment. I usually gamble between $25 and $50 or so in all of the races. The objective is to have excitement going for some type of prize instead of just watching a bunch of horses go by without interest in any. After this great event ends, there's the Official LIV Boardwalk After Party. Here are some articles about the projected runners and their odds at this time. They will change as the race gets closer.